Sings of Spring first, then a rummage through the archives to see how 2019 now compares to past years. On the migratory duck front, I’ve seen a pair of Goldeneyes. The last traces of snow are gone from my back yard and the north side of my roof. Some hiking trails on Tunnel Island are mainly clear, but the B trail is not good: it had long stretches of slippery ice on the path last time I tried it. The town came and swept the sand off my street and sidewalk. Yay! and thanks. Warm roads would wear down the soft compound on my ice tires rapidly, so I put my summer tires on for this weekend’s road trip. Now I can roll my eyes righteously whenever I hear someone go by on studded tires. Now let’s compare my April 18th pictures from this year to pictures taken on around the same date during the last five years. I’ll focus on two parts of the lake: the Town Island to Scotty Island stretch, and Treaty Island because it’s next to Rat Portage Bay and Devil’s Gap. Here’s what it looks like this year. There are small amounts of open water in the Town/Scotty end of the Manitou. 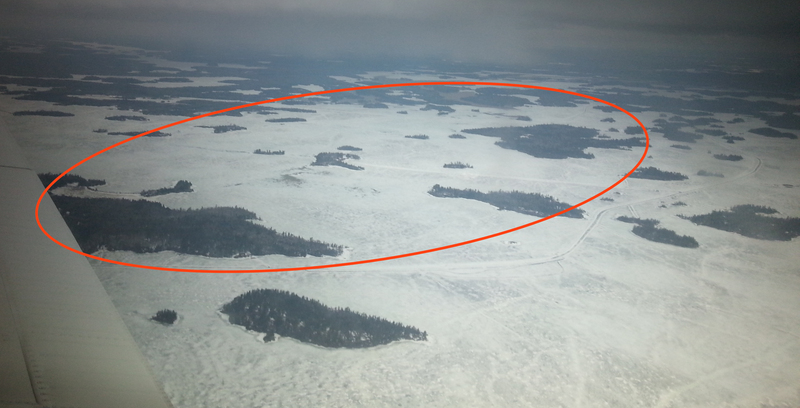 Treaty Island is almost entirely frozen in right now. Devil’s Gap, at the right end of the oval, has some open water. Last year was a slow spring. On April 18th of 2018, there was no open water around Town Island, let alone Scotty. Treaty Island had only a little water showing at Devil’s Gap. Okay. On to 2017. I have pictures from April 20th that year. This is going to make you feel bad. Not only could you reach Scotty Island, you could Reach Middle Island and parts of Hay Island, too. 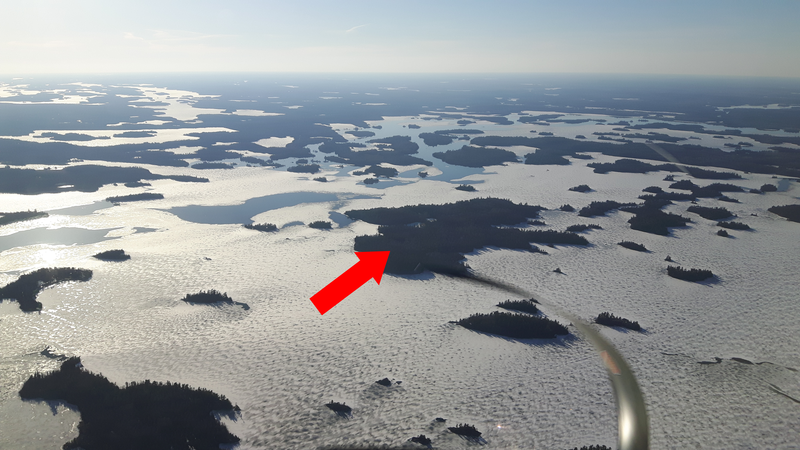 Treaty Island had no ice at all. 2016: These pictures are from April 19th. 2016 wasn’t quite as good as 2017, but you could drive a boat to the west end of Town Island, and you could get within shouting distance of Scotty Island. Ice was rotting around Treaty. 2016 was an average year, with ice completely gone in the first few days of May. 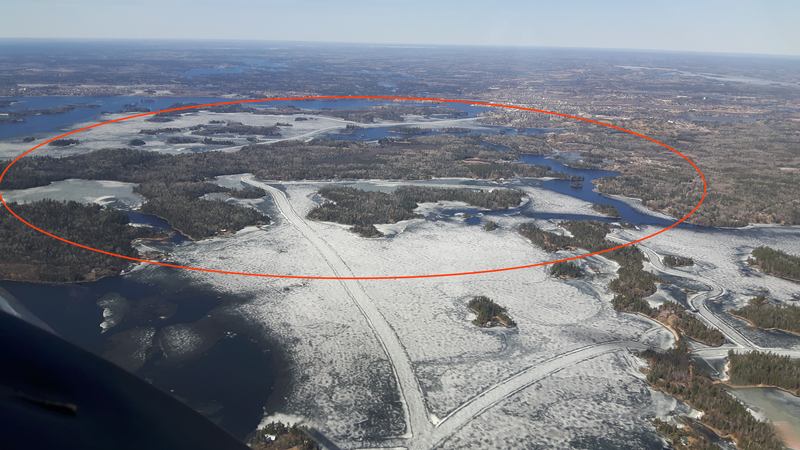 Ice was weakening by this time that year, but not yet clearing much around Town Island. Another average year. Lastly, 2014, from April 21st, a miserable day with heavy cloud and snow flurries. No open water anywhere near Town Island, and as for Scotty, fuhgetaboutit. Ice-bound, with just a trickle of water open in Devil’s Gap. Rat Portage Bay was solid. 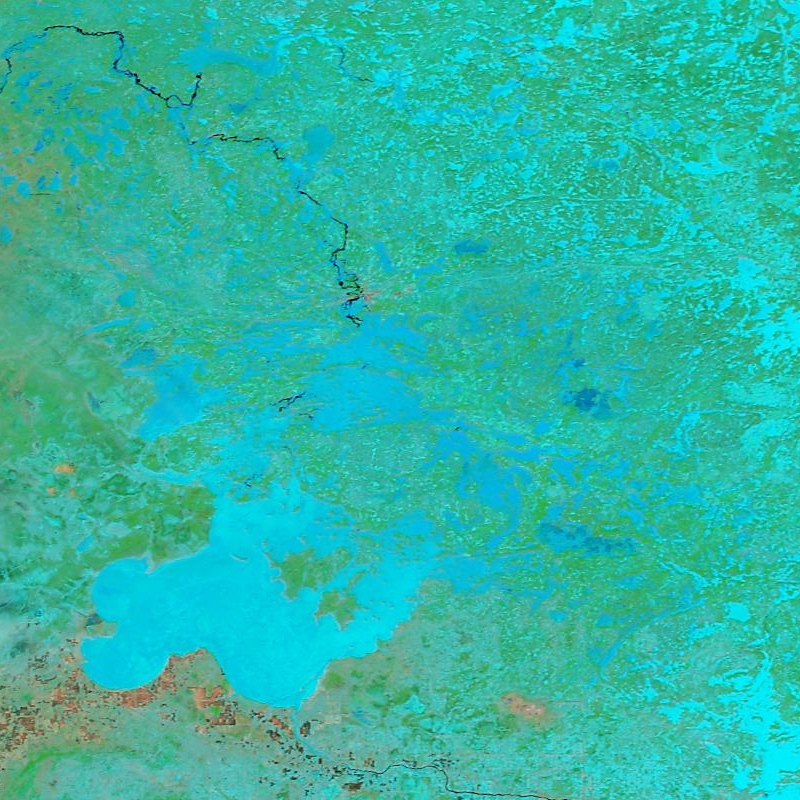 2014 was very late: the ice wasn’t all gone until May 21. The dates change from year to year, but the pattern of ice-out is pretty consistent. These two sample areas open together. This year’s thaw is nowhere near the best, but it won’t be horrifyingly late. We’ve got another four days or so of warm temperatures before things turn a little cooler for a while, with some overnight lows likely to be just below freezing, and daytime highs sinking as low as 5ºC. I hope I don’t regret changing my tires. Below normal temperatures could stretch on for ten days. The more the lake opens now, the more the ice will be vulnerable to wind and rain, even during that cold stretch. It’s hard to guess how this will play out. If we could stay warm, we would certainly do a lot better than last year’s May 14th. But if things turn cold until the beginning of May, we might still end up around the same. I’ll be talking to Ken O’Neil at Q-104 on Monday morning, and after that a training flight should give me a chance to take some fresh pictures. I’m hoping there were big changes over the Easter weekend. It was gusty and bumpy today at low altitudes today, so I took one quick picture from fairly high up before descending into the turbulence to land. 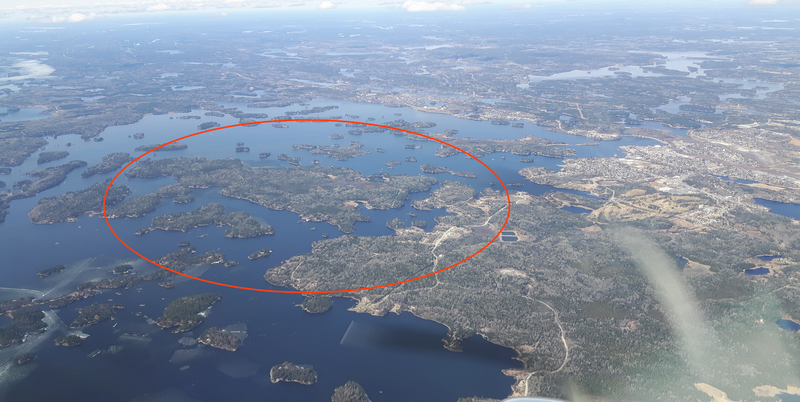 Still, it’s a useful picture, taken from 6500 feet above sea level, (or about a mile above the lake) because it shows all the area that was hard to photograph on Tuesday, when we had to fly low. The photograph looks north west, with Treaty Island near the middle of the frame. 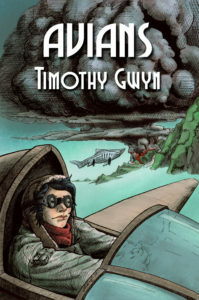 Gun Club Island is at the precise centre. 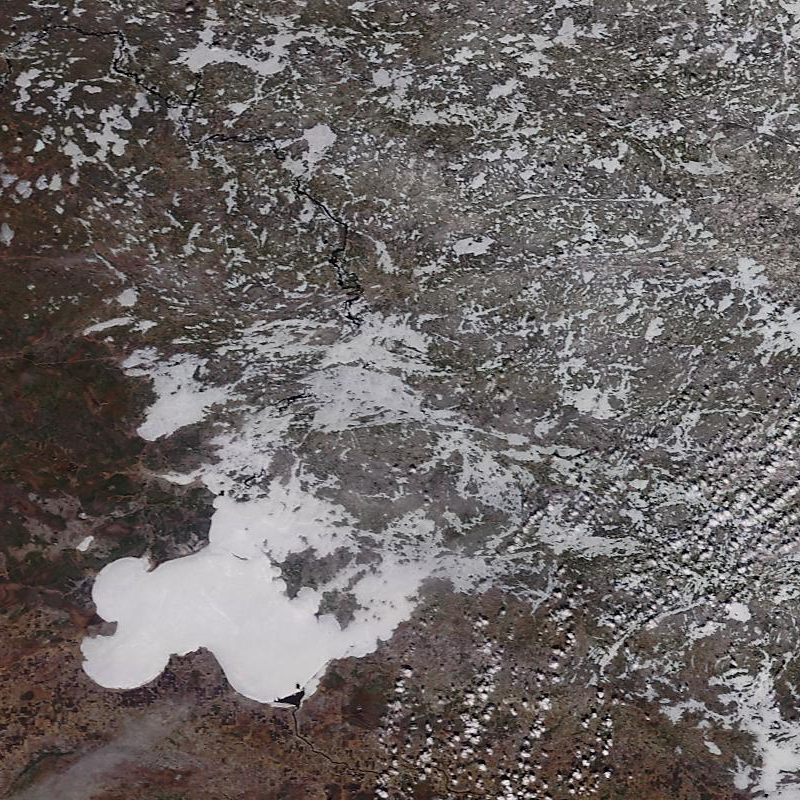 There might be a little more water showing at the left edge, where Keewatin Channel turns into The Tangle. Water on Safety Bay seems to be creeping out to Yacht Club Island. Devil’s Gap looks about the same, especially at the Rat Portage Bay end. There hasn’t been much progress lately. Temperatures have been low, and although rain did remove a layer of snow cover, it soon snowed again and covered everything up. The only places the ice is yielding is where the current is strong. 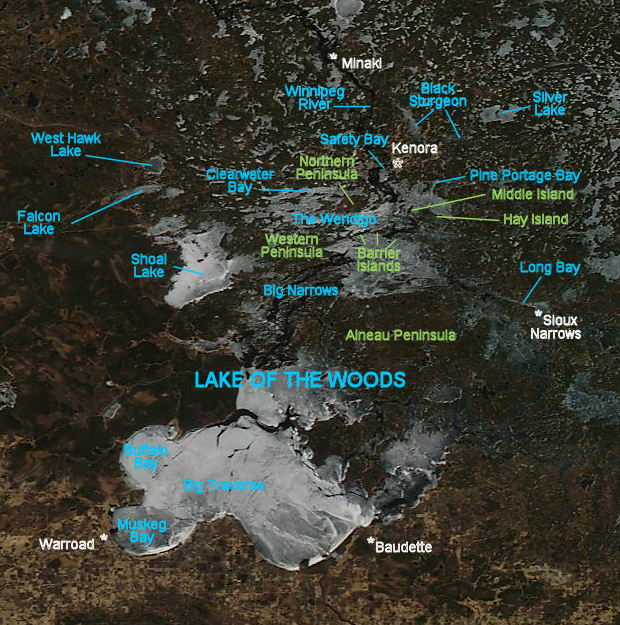 The rest of the lake—and all the other lakes in the area—are still ice covered. I’ll range further when conditions improve and there’s something to show for it. In the meantime, the forecast is for snow tonight. The Weather Network says only a centimetre or so, while Accuweather says six to twelve centimetres. Environment Canada splits the difference, calling for two to four. I guess we’ll find out tomorrow. I felt like it was time to look back and see how our current ice conditions compare to those of the last few years at this date. As it happens, I have pictures from April 9th for 2019, 2018 and 2015. For 2016 and 2017, I have pictures from within a few days of that date. 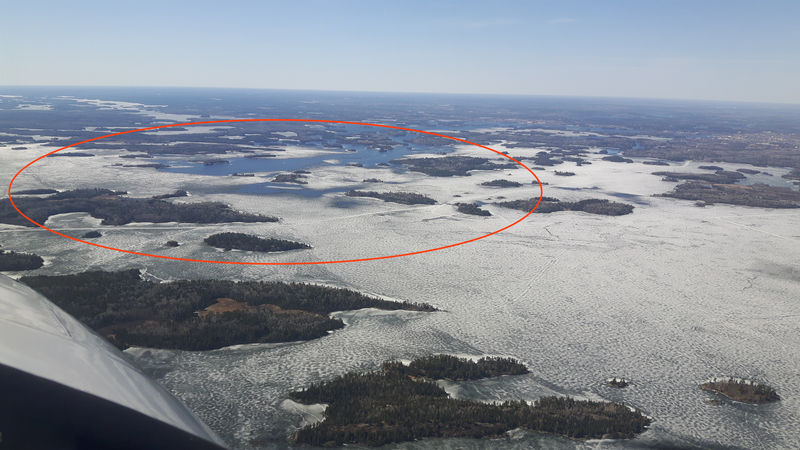 Of course, they were all taken from different heights and in different directions… but Town Island appears in each one, so I’ve marked it with a big red arrow. The arrows point roughly north, by the way. Don’t forget: you can click on the pictures to see a full-screen, zoomable version. Lets have a look. Here’s one of yesterday’s pictures. April 9, 2019. The low camera angle makes this picture hard to decipher, but zooming in may help. Not a whole lot of open water yet this year. A picture taken exactly one year earlier: April 9, 2018. But cheer up, last year was worse. Look at all that strong white ice on Rat Portage Bay. Ice-out in 2018 wasn’t until May 14th, though, so doing better than that is setting the bar pretty low. Two years ago: April 7, 2017. 2017 was an early spring. The ice was all gone a couple of weeks from now. 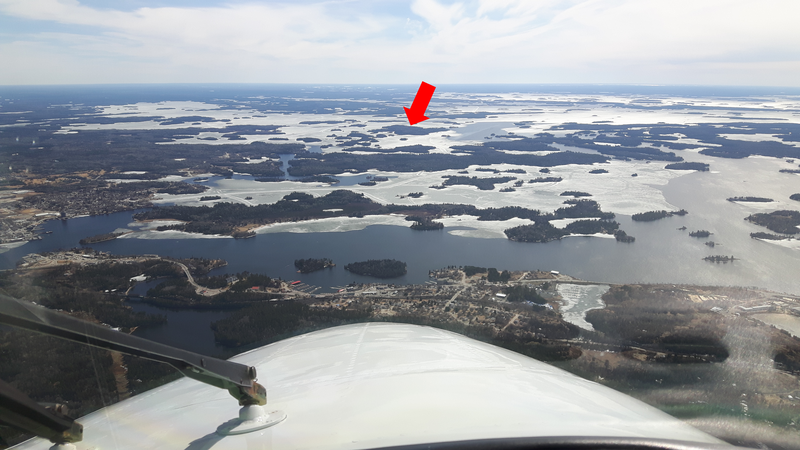 In this picture you can see that Safety Bay and Keewatin Channel are running freely, and water reaches out past Town Island towards Scotty. Three years ago: April 13, 2016. 2016 was mild, too. 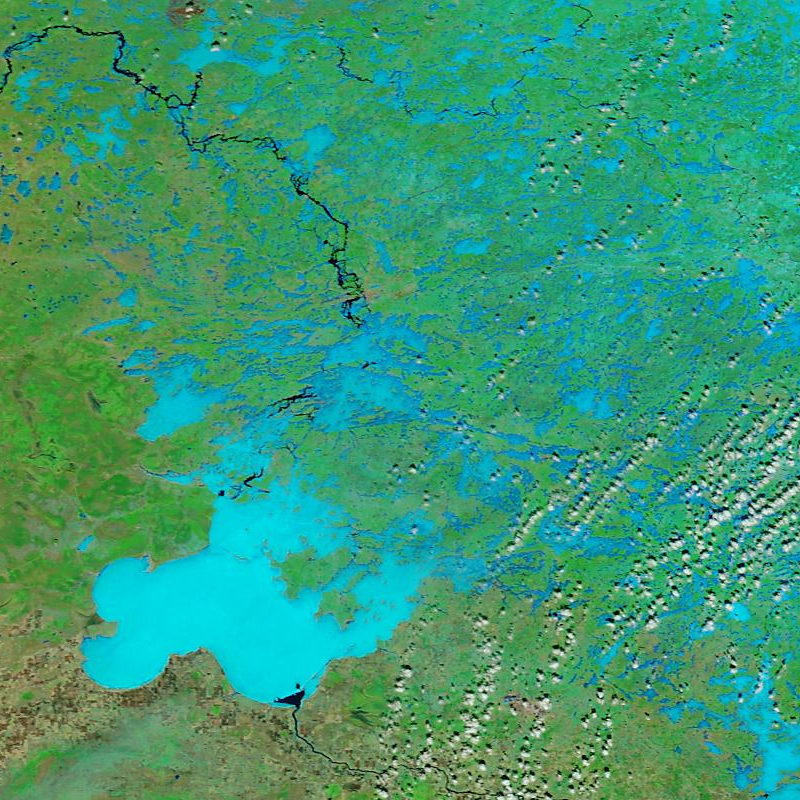 By the 13th of April, the water extended almost as far as 2017. Then things slowed down and we held on to some ice until early May. Four years ago: April 9, 2015. April of 2015 had progressed more than this year, but ended up having a normal ice-out of early May. I don’t have pictures from the right time period in 2014, and the camera I used then wasn’t as good. I can tell there was more ice at about this time than there is now. That’s cold comfort: ice-out in 2014 wasn’t until late May. In summary, you can’t really look at one day and make an accurate prediction that spans the coming weeks. However, I will say that it no longer looks as if we have much chance of an early thaw. We’d need favourable conditions to be ice-free by early May, and the forecast doesn’t offer much hope of that. You have commented on the air temperatures in Kenora and how they seem to be holding below normal. I quote from an article I read recently: “Snow cover, or lack of it, can have a dramatic effect upon temperatures. For example when there is no snow on the ground at La Crosse, WI, the January daily average temperatures are 11.2 degrees warmer than when there is snow on ground.” OK, so let’s make that 5 degrees C.
Looks like temps will not return to normal until the ground becomes snow free. As we locals all know, there remains a fair amount of snow cover in the area, and that snow is really dense, more like ice than snow. There are still 5 cm of snow at the Kenora airport according to their data for yesterday. At the beginning of the month we had 8 cm at the airport, so the snow melt rate is really slow this year. Last year on this date there were 12 cm of snow on the ground and it took 10 days to become snow free. So what does this mean for LOW ice out? Well I calculated last year that it is 27 days on average from no snow cover at the airport to ice out on LOW. Given the short term forecast, it seems unlikely that the airport will be snow free until this weekend at the earliest. At this time of year those 5 degrees might mean refreezing overnight, which delays melting a great deal. Last year it took some double digit temps to finally get to snow free at the airport, and that, according to the forecast seems highly unlikely in the near future. But let us be optimistic and say the airport is going to be snow free this Sunday. 27 days from Sunday is May 11. Hate to say it, but this year sure looks a lot like last year, you called ice out on the 14th, right? One caveat though. Last year the temps got into double digits almost every day by about the 19th of April. 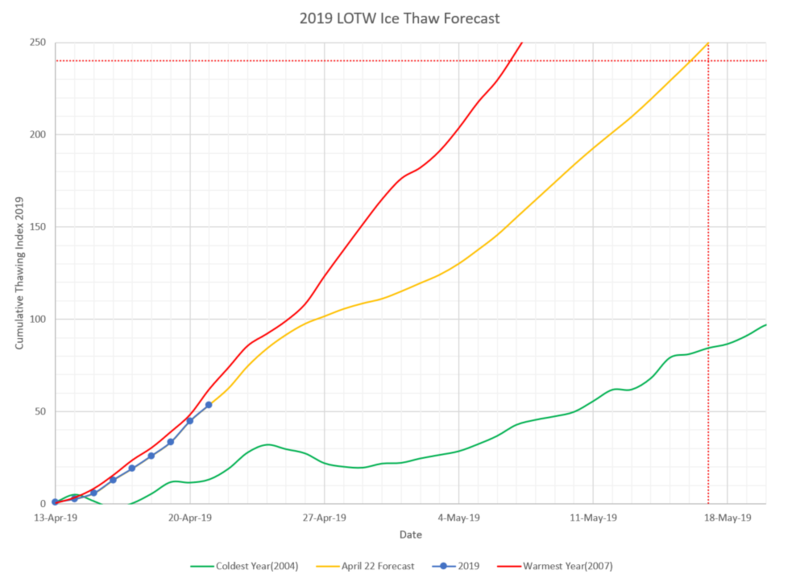 No sign of that happening this year according to the long term forecast, sigh…..looks like another late breakup, probably after the (optimistic) May 11th cited above. That’s pretty depressing. While I’m reluctant to forecast a late ice-out on the basis of any one single factor, we’re now looking at three unfavourable things: extensive ice, significant snow cover, and forecast cool temperatures. My predictive method is mostly ice-based. I use comparisons like the one in this post to measure progress and gain perspective. It’s not looking great. Stu’s preference is to look at snow cover. He’s not optimistic at all. Sean uses mean daily temperatures: starting when that value rises above freezing, he weighs the forecast warmth against the severity of the winter. The mean temperature isn’t consistently above freezing yet, so he hasn’t even started his calculations. Accuweather offers a forecast for all of April. That’s a long way ahead, so let’s consider it largely speculation, but they aren’t calling for double-digit temperatures until the week of the 21st. And we’re looking at another snowfall Thursday night.